Mental Activity For Seniors: One of the many positive factors surrounding home care from our agency includes the regularity of mental activities provided by our caregivers. With your loved one receiving assistance from a homecare agency in Chicago, a variety of needs are met. As we age, our resilient, dynamic brains are still constantly growing with new neurons forming. Those neurons form as a result from a variety of activities, both new and familiar. Brain aging and memory loss were once thought to happen because neurons died or simply stopped functioning. However, studies show that stimulating the brain improves its function and can ultimately protect neuronal connections, lessening the risk of cognitive decline. New mental research shows that the neurotransmitter dopamine can trigger the formation of new neurons in adult brains. In fact, these neurons move directly to the brain associated with higher mental function. This could be the basis of what some would call mature wisdom. Here at Home Care Powered by AUAF, a caregiver can help your loved one feel less alone. They will be more engaged through compassionate management of various activities. 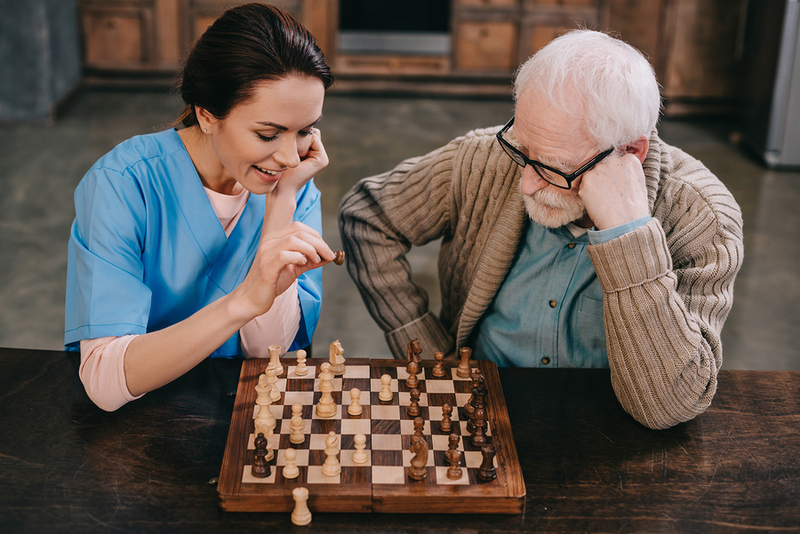 Everything from crossword puzzles, playing board games, painting, listening to music, to simply just ensuring regular social activity have been proven to yield positive results when it comes to maintaining neurological health. In-home caregivers help clients avoid a debilitating sense of isolation. Having a caregiver at the ready gives patients the confidence to follow their healthcare provider’s recommendation to remain active. As most doctors will attest, what’s good for our physical health and well-being is also good for our brain. Certain board games and brainteasers can help create new associations between different parts of the brain, which keeps it sharp and functional. Our caregivers at Home Care Powered by AUAF are trained to provide more than just physical care. They assist in every facet that might be cause for concern with a loved one. The comfort of having another person to talk to can be invaluable of course. Added to that includes the pure pleasure of engaging one another with mental exercises, enjoyable games, and favorite kinds of music can improve overall quality of life. Seniors will feel more connected and actively engaged in ways that can ultimately affect high-level cognitive processes, resulting in a healthier brain.